Helm, June and Thomas D. Andrews. "Tlicho (Dogrib)". The Canadian Encyclopedia, 16 October 2018, Historica Canada. https://www.thecanadianencyclopedia.ca/en/article/tlicho-dogrib. Accessed 24 April 2019. Extended kinship ties have allowed easy movement of families from one band to another. From a population of about 800 (mid-19th century), the Tlicho numbered some 1700 by 1970, over 2000 by 1996, and the 2006 census recorded 2020. 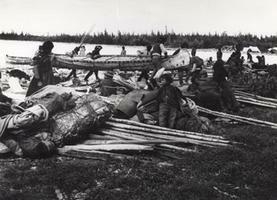 A group of Tlicho coming ashore on Great Slave Lake, circa 1895 (courtesy Provincial Archives of Alberta/B779). Tlicho, also known as Dogrib, fall within the broader designation of Dene, Aboriginal people of the widespread Athapaskan language family. Their name for themselves is Doné, meaning "the People." To distinguish themselves from their Dene neighbours - Denesuline, Slavey, Sahtu Got'ine and K'asho Got'ine - they have come to identify themselves as Tlicho, meaning "dog's rib," although the epithet is derived from a Cree term. Tlicho lands lie east of the Mackenzie River between Great Slave Lake and Great Bear Lake in the NWT. From ancient times to the present, Tlicho have hunted the barren-ground caribou in the boreal forest during winter and followed them to the edge of the barrens in spring, where they meet them again in the fall. Moose and hare of the forest, and migratory waterfowl and fish have also been important food resources for the Tlicho. In earlier times, supernatural powers gained through the aid of animal-spiritual beings were experienced by many persons. Within each Tlicho community, hunting prowess coupled with generous concern for the well-being of the group, wisdom, oratorical skills and "medicine" power led to authority and leadership. Fort Rae (1852), on the north arm of Great Slave Lake, was the first trading post established on the Tlicho lands and the Tlicho began to be drawn into the fur trade around the beginning of the 19th century. Roman Catholic missionaries began the conversion of Tlicho in 1859. In the early 19th century, Tlicho were intimidated and attacked by members of the Yellowknives band however, in 1823 a massacre by Tlicho of Long Leg's Yellowknife band broke the threat. 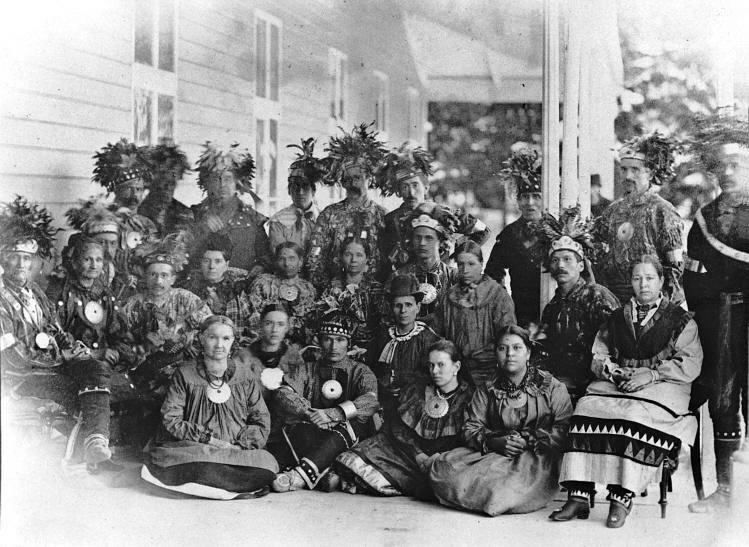 Tlicho oral tradition describes how, a few years after the massacre, the Tlicho chief Edzo and a few companions met the great Yellowknife leader, Akaitcho, and members of his band, and by medicine power and oratorical force brought a lasting peace. Schools that were established at Tlicho settlements during the late 1950s facilitated access to southern schooling and prepared children for non-traditional occupations. Behchoko (formerly Rae-Edzo) has transformed into a year-round settlement for hundreds of Tlicho. Other, smaller settlements include Detah, near the city of Yellowknife, and hamlets at Whati (formerly Lac la Martre), Gameti (formerly Rae Lakes) and Wekweeti (formerly Snare Lake). In the isolated hamlets, the traditional reliance on hunting, fishing and fur trapping remains vital. Fur trapping as a traditional activity, has been declining steadily since the late 1980s and it is widely held in the north that this is a direct consequence of the animal-rights movements. With the recent development of four diamond mines within traditional Tlicho lands, many men and women are employed by the mines or the mining support industries. In 1921 the Tlicho, with other Dene groups of Great Slave Lake, signed Treaty 11. With increasing development pressure in the Mackenzie River valley during the 1960s and 1970s, and with many provisions of the treaty that were never fulfilled, the Dene lobbied the federal government to secure their political, land, and other rights in the NWT. Beginning in 1981, under the united polity of the Dene nation, the Tlicho participated in the negotiation of a comprehensive land claim. 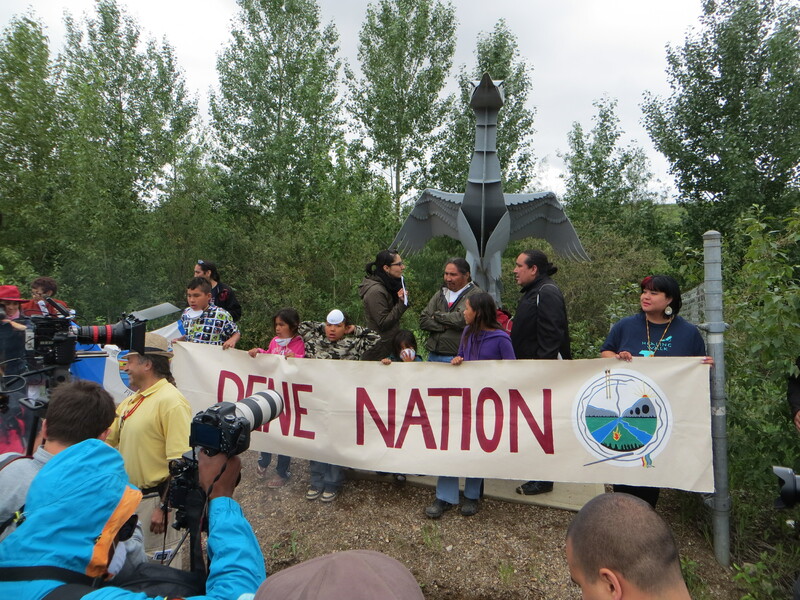 When the Dene leadership voted to reject the final draft agreement in 1990, negotiations collapsed and the federal government began negotiating separate agreements with regional Dene groups. 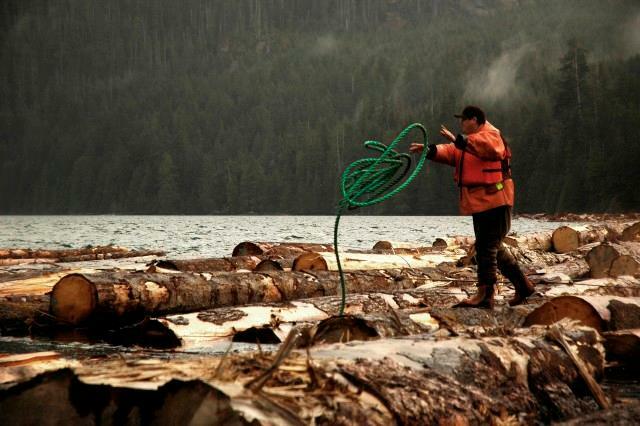 In 1995, the Tlicho began negotiating a separate land claim based on a unique formula by including provisions of both a comprehensive land claim and a self-government agreement. (see Aboriginal Self-Government) The Tlicho Land Claim and Self Government Act received Royal Assent on February 10, 2005 and since that time the newly formed Tlicho Government established a working governance structure that provides programs and services to manage the various provisions of the land claim. The claim provided the Tlicho with ownership of 39 000 square kilometres of land in a single block, shared management rights over Crown Land within the claim area, $152 million in compensation paid out over 14 years and a share of federal mineral royalties from the Mackenzie valley. As well, the claim grants law-making authority over Tlicho citizens in Tlicho communities on Tlicho lands and includes aspects of education, adoption, child and family services, training, income support, social housing, and Tlicho language and culture. Though the Tlicho Government is actively investing its new-found wealth from land claims and from the impact and benefit of agreements with the diamond mines and business interests in the Northwest Territories and throughout Canada, they are also investing in the education of Tlicho youth. In 1991, the Tlicho school board adopted an educational philosophy they called "strong like two people," which builds on traditional Tlicho culture and values, integrating them within the standard "bricks and mortar" school system. Today, children in the Tlicho school system are as likely to participate in summer canoe trips or winter hunting camps where they learn Tlicho culture and practices from elders while travelling on the land and participating in traditional activities, as they are to participate in a classroom setting where they learn the skills-oriented educational program common throughout Canada. By providing their children with this "combined" education, elders believe the children will grow to be "strong like two people." The Tlicho government supports this educational philosophy through its legislative control over education and the Tlicho language and culture. Though change has been dramatic in Tlicho culture over the last century, today the Tlicho people have assumed control of their own destiny from the federal and territorial governments and are actively providing for their future well- being with investment in their children's education. See also Aboriginal People: Subarctic and general entries under Aboriginal People. June Helm, ed, Handbook of North American Indians, vol 6: Subarctic (1981) and Prophecy and Power Among the Dogrib Indians (1994). TłįchôThe website for the Tłįchô Government in the Northwest Territories. Provides information about local communities, businesses, and agencies. Also features an overview of the Tłįchô Cosmology Project.